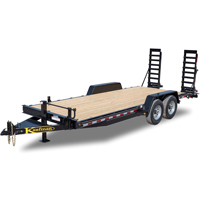 Kauffman’s Tilt Equipment Trailers are the most popular of all the models we sell! This trailer is very versatile for construction use, farm use, or the landscaper. The advantage of this model is that you don’t need ramps to load your equipment.